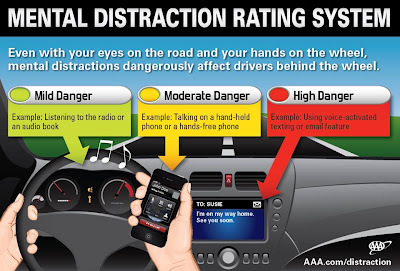 From AAA: Hands-free technologies might make it easier for motorists to text, talk on the phone, or even use Facebook while they drive, but new findings from the AAA Foundation for Traffic Safety show dangerous mental distractions exist even when drivers keep their hands on the wheel and their eyes on the road. The research found that as mental workload and distractions increase reaction time slows, brain function is compromised, drivers scan the road less and miss visual cues, potentially resulting in drivers not seeing items right in front of them including stop signs and pedestrians. This is the most comprehensive study of its kind to look at the mental distraction of drivers and arms AAA with evidence to appeal to the public to not use these voice-to-text features while their vehicle is in motion.